I have to share this awesome video here also. 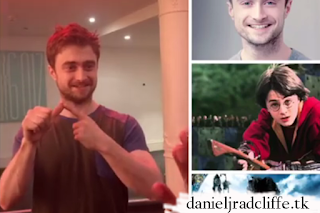 Nazia shared the following video with me on Twitter in which she taught Daniel British sign language for "Hello my name Daniel actor" after a performance of Rosencrantz and Guildenstern are Dead at The Old Vic Theatre. Update: 9th March 2017. Another video has been posted on the Facebook page. They taught him there to sign "I love you" with American sign language. It reminded me of Life and Deaf association's Sign Good Morning campaign back in 2013. Last video we promise .. we went to see him , he remember us we have little talk about Sign Language .. I showed him this page video of him learn British Sign Language he saw it, said that wow amazing can't believe lots of deaf community love him so much..